Avocados originated in Mexico and the country remains the world’s leading producer. Farmers in Michoacán (where 92% of Mexico’s avocados are grown) harvested 1.1 million tons of avocados in the 2010-2011 harvest season, 40% of the world total. About 125,000 hectares, or 11.5% of all agricultural land in Michoacán, is currently under avocado orchards. The value of avocado exports has tripled over the past five years. Exports in 2011 totaled almost 400,000 metric tons and were worth 990 million dollars, compared to 338 million dollars in 2006. The main export markets are the USA (80%), Japan (9%) and Canada (6%). Part of the reason for strong exports is due to an increased demand from US consumers but it is also due to new menus in fast food chains. The addition of avocados in 2010-11 to the menus of Burger King and Subway restaurants has since been followed by competitors such as Wendy’s, so US demand for avocados should continue to grow. Avocado growing has not been entirely plain sailing in recent years. Growers organizations have reported that costs of the inputs of water, fertilizers and electricity required for avocado growing have all risen sharply. Avocado growers are also having to confront a relatively new challenge that increases the cost of doing business. According to an article in Mexico City daily La Jornada, growers are now being forced to pay “protection money” to criminal gangs operating in Michoacan’s avocado-growing zone. The article claims that avocado producers in 13 municipalities in the state of Michoacán face almost daily demands for “protection” payments if they are to continue farming and avoid kidnappings and other forms of violence. It goes on to say that many smaller growers near Uruapan, Zitácuaro and Ziracuarétiro have chosen to rent out or sell their avocado orchards and move away from the area entirely. In addition, one of the criminal groups is demanding up to $1,000 pesos (75 dollars) a plant for every avocado plant purchased from specialist nurseries. Several different groups are alleged to be involved. Avocado packers and truck drivers are also made to pay “fees” which can amount to between 40% and 60% of their normal income, according to anonymous representatives of national organizations speaking to the press. 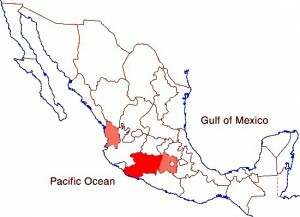 The situation affects avocado growers in many places, including Los Reyes, Uruapan, Salvador Escalante, Acuitzio, Tacámbaro, Ario, Teretán, Apatzingán, Tacíntaro, Nuevo Parangaricutiro, Peribán, Tingüindín and Zitácuaro. At one time, there were as many as 22,000 avocado growers, half of them working only small orchards. The protection rackets have meant that new plantings have become the preserve of a relatively small number of larger farms, and it is currently estimated that the total number of growers has shrunk to around 17,500. Remittances are on the rise Have Mexicans given up on the dream of moving to the USA?